Message on behalf of TEU, urgent meeting at Victoria University of Wellington this afternoon. The decision announced earlier today to sack two lecturers in Victoria University’s International Relations programme to make way for new “themes” in the programme based around Security Studies and the Asia-Pacific region will lend urgency to a meeting of staff, students, University Council members and MPs scheduled for 4pm Thursday 18 August at the Kelburn Campus’ MacLaurin Lecture Theatre 102. “There is no question of a lack of funds or student demand in the programme. On the contrary, an additional investment is being made. But younger staff, attempting to raise a family and build an academic career, are losing their jobs. “We are particularly concerned that the university’s Academic and Faculty Boards, representing students and staff have not been consulted and that recent resignations in the programme have not been used to avoid making staff redundant. There is another meeting happening to discuss the change proposal and responses to the VUW Council, on Wednesday 24 August at 5pm, until 8pm, in the Adam Art Gallery, Victoria University of Wellington. This meeting is being called to discuss, organise and coordinate nationwide resistance on campus. Amongst other things, the university is under attack from the government, with VSM set to pass in the next month. It is also under attack from its own management, with lecturers being sacked and research shut down in Wellington; whilst key academic conditions are being taken from academic staff in Auckland. Robbie Shilliam, a lecturer in International Relations at VUW, will speak briefly about general issues. Joe Kelly, an ex-student, will speak about past experiences of occupations which have occurred at VUW. We will then discuss how to most effectively build resistance on campus, and make some plans. The change proposal can be accessed here. Next Wednesday (March 31st) at 12.30pm, the NEZI primary teachers’ union is holding a rally at Parliament to present its petition opposing the government’s imposition of “national standards”. The teachers are at the forefront of the union opposition to this government. Come along and give them your support! I’m passing this around, in case any greenies are so inclined & qualified. Applicants should possess a PhD in Peace and Conflict Studies or a cognate discipline, and have an established or emerging track record of systematic research and publication. They should also have teaching experience at the tertiary level. Given that Peace and Conflict Studies is a new programme, candidates should be able to demonstrate skills in academic curriculum development as well. * Will have a research background in peace and conflict studies with a significant number of peer reviewed publications. Some preference will be given to those with advanced knowledge in conflict analysis and resolution. * Will contribute to the research environment by developing/contributing to local and international research groups, by attracting postgraduate students, and by competing successfully for research funding. * Will be expected to teach two postgraduate courses per year in the area of Peace and Conflict Studies and to supervise 400-level Honours, Masters and PhD students. * Will contribute to the administration and development of the Centre in particular, and the Division of Humanities and the University of Otago in general. The position is available from 1 June 2010 and it is hoped that the successful applicant can commence duties as soon as possible around that time. Applications quoting reference number A09/163 close on Friday 22 January 2010. It’s that time of year again, so on behalf of student activists on Victoria University of Wellington campuses, I’m going to say something about tertiary education policy. I principally joined the Greens in 1999 in shock at the $3 billion student debt, with the realisation that the Green Party had the best idea of how crippling this was going to be for an entire demographic of young grad’s, for a good chunk of their future. I have been gratified to see first Nandor, then Meyt, achieve gains in the areas of interest write-offs on student loans, then interest-free student loans (but sadly, not back-dated); and a constant policy of universal access to student allowances, which is still in the campaign for accessible education for all. The VUW Council is meeting at 3pm on Monday, 6th October, 2008 to discuss fee-setting for 2009. It is expected that a 5% fee rise will be put to Council members to vote on. The Education Action Group (EAG) is calling for all students with an interest in this issue to meet at VUWSA, ground floor of Student Union Building, Kelburn Campus, at 2.30pm, on Monday 6th October, 2008, before proceeding over to the public gallery of the Hunter Council Chamber, to protest against this fee rise. A 5% fee rise means an extra $186 – 309 per undergrad average years’ enrollment, or $235 – 274 increase for taught post-grad, $216 – 262 increase for post-grad by thesis. That’s a lot of lunch-money, or a couple of weeks’ worth of rent if you’re lucky. Currently, Student Debt is at $10 billion*, with an expectation that this will tick over to $11 billion in the new year, before the fee rise mooted will take effect. Constant fee rises each year only exacerbate the rate at which the total student loan debt increases. Interest-free loans policy is only a palliative for this problem, which is keeping young graduates working overseas for longer and longer periods of their lives in order to keep debt under control. 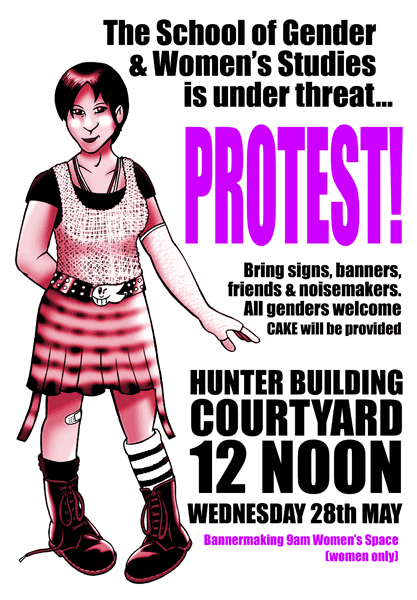 Come and join the protest! There will be a banner-making session at 5pm on Sunday, 5th October, in the foyer outside VUWSA reception; anyone interested please e-mail president@vuwsa.org.nz for further information on building access. Volunteers wanted to help with leaflet drops and poster-runs; reply to same address if you want details of how to help with this.